Just 150 meters from Jomtien Beach - a fantastic location! Buy condo Pattaya - Prices start from 1.19 million Thai Baht. Rent condo Pattaya - from 10,000 Thai Baht per month. Thip Condotel is in great location in Jomtien, just 150 meters from Jomtien Beach! There are plenty of restaurants, shops, beauty and massage parlors and bars in the vicinity as well as attractions, markets and Jomtien Beach. 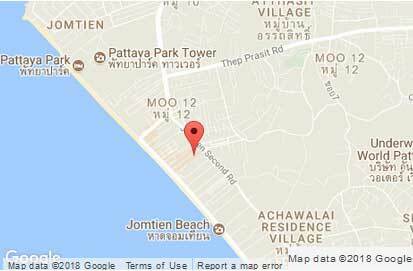 The condominium is located on soi 7 Pattaya - Jomtien, and from here Pattaya is easily accessible via the back roads, Sukhumvit Road or along the beach on Jomtien Beach Road. From Jomtien Beach Road you can catch the baht bus at any time of the day or night into Central Pattaya for only 10 baht where you will find an abundance of shops, restaurants and bars, a vibrant night life, plenty of tourist attractions to keep you entertained and 4 km of beach offering various water sports and trips to the nearby scenic island of Koh Larn. In the soi 7 Pattaya area you can also find beauty salons, massage parlors where you can enjoy relaxation treatments and traditional Thai massages, a range of shops and markets offering items such as clothing, souvenirs and fresh fruit and vegetables.